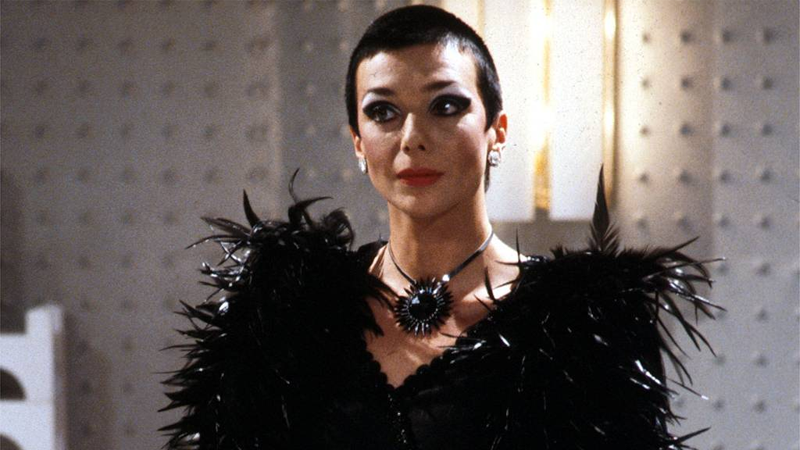 Jacqueline Pearce, best known to sci-fi fans as the glamorous and calculating Servalan on the cult British space drama Blake’s 7, has died at the age of 74. As Doctor Who News notes, in her long-running acting career she made several genre appearances — including guest roles in The Avengers, starring turns in the Hammer Horror classics The Plague of the Zombies and The Reptile, and even a fabulously-named appearance as Chessene of the Franzine Grig in the Doctor Who multi-Doctor teamup “The Two Doctors”. But many fans will remember Pearce’s role in the beloved British sci-fi series Blake’s 7 as Servalan. Originally intended to only appear in a single episode, the relish with which Pearce played Servalan — a wry, calculating sociopath in the show’s despotic Federation, solely driven by her goal to crush Blake and his crew — saw her evolve into the show’s primary villain. It was an incredible performance, only matched by the radical sci-fi fashion of Servalan’s wardrobe, giving Pearce a litany of iconic looks as she cackled her way across the four seasons of the show. Our thoughts go out to her family and friends.